Hi, groups! It’s MAKER MOMENTs! 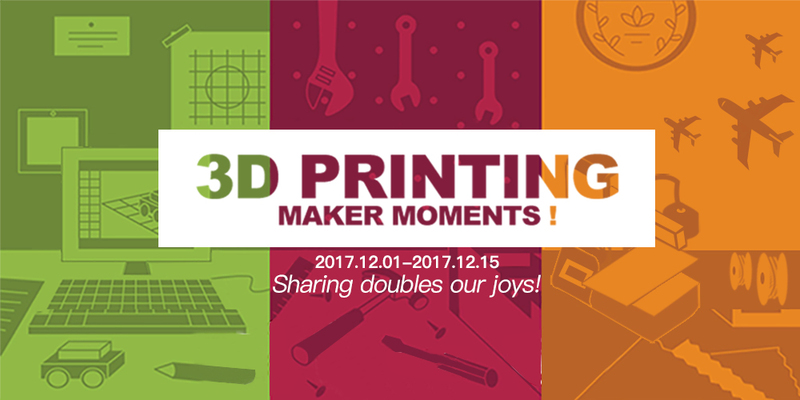 This time we bring Geeeetch users together to share your 3D printable creations, for example, a 3D printed crawling Arduino robot, a spinner gadget, a painted 3D printed boat, etc. Any 3D printable project is eligible for this contest, so forget about limitations and get creative. Post your original work. The ones with the most likes by Dec 15th 11:59 pm (GMT+8) will be our winners. 9 total winners will be announced in this group after the contest. Join us by posting photos and telling us your story about your creation in Geeetech 3D PRINTER USER CLUB (OFFICIAL). In your post, don’t forget to add the hashtag #GeeetechMakerMoments. Don’t worry! If you don’t get the first three prizes, we offer each participant a $5 coupon. Be your original prints. You can download Stl. files from thingiverse or other platforms. If you are good at designing, it would be perfect. Each participant only has one chance. You can upload several photos to show your print in different attractive views. More details obtain more likes! To get more supports, we suggest that you record your print with a time-lapse video, upload it to Youtube and attach the link to your post. For the fairness and authenticity of the contest results, we require that winners must share your videos to all the group members once be elected. All the participants should use your Geeetech 3D printer during the whole printing. Contest period: Friday, 12/01/2017 at 10:00 AM (GMT+8) ~ Friday, 12/15/2017 at 11:59 PM (GMT+8). All the prints must be uploaded in this group no later than Sunday, 12/15/2017 at 11:59 PM (GMT+8). The winners will be announced on Monday, 12/18/2017 in this group.